2B com cozinha completa, dormindo confortavelmente 8 pessoas! 2 quartos Deluxe unidade acomoda até oito pessoas. Fique a uma curta distância do Centro de Convenções Gaylord! Apreciar a bela Wyndham National Harbor Resort, onde todos os confortos de casa esperam por você depois de um dia de exploração. Cada unidade contém uma cozinha completa. O resort dispõe de todas as comodidades, tais como uma piscina coberta, fitness center, serviço de portaria e atividades para as famílias. Você vai ficar dentro do porto novo Distrito Nacional, que é carregado com restaurantes e atividades maravilhosas. Há um serviço de traslado que sai a cada hora de 6 a. m. até 8:30 p. m. e leva-o ao rei St. Estação de metrô. Saiba mais sobre a incrível história U. S., explorar museus de arte de classe mundial, visualizar arquitetura surpreendente e mergulhar na cozinha multicultural mais concentrada do mundo. A cidade oferece experiências de aprendizagem para todos os sentidos, para todas as pessoas, de todas as esferas da vida. D. C. realmente estar no seus próprios como um lugar único e surpreendente para visitar. Todos os quartos principais têm camas King Size. Os quartos de hóspedes têm duas camas de casal. O sofá da sala se desdobra em uma cama de casal para dormir espaço extra. Há lavanderia com três arruelas de cortesia e secadores em cada um dos 11 andares. O estacionamento está disponível no St. George Parking Garage do outro lado da rua do Wyndham National Harbor por US $ 20 / dia com acesso in / out ilimitado. O estacionamento no centro de Washington é muito limitado devido ao número de passageiros que viajam para a cidade todos os dias. Verifique com o concierge quando você chegar para lugares sugeridos para estacionar e taxas. As taxas médias de estacionamento no centro da cidade são de US $ 18 a US $ 25 por dia. Há também uma grande transporte público. O Metro Bus NH1 pára em frente do resort e vai levá-lo para a Linha Verde na estação Avenue Branch. O táxi aquático vem buscar os hóspedes no Potomac e cabeças sobre a Old Town Alexandria e D. C. Adequadas, ou muitos clientes preferem o transporte gratuito que sai a cada hora a partir da Área Nacional Harbor. Leva-o ao rei St. Estação de Metro, que é um passeio de 10 minutos para D. C.
Ao enviar um inquérito, você está concordando em assinar o meu e-mail lista de semanais Resort Promoções e estadias em resorts de última hora. A Área National Harbor é o lar de muitas trilhas para caminhada e trilhas de bicicleta. Muitos convidados trazer bicicletas ou alugar bicicletas para baixo pelo rio. As trilhas de bicicleta percorrer todo o caminho para Mount Vernon. Há maravilhosos restaurantes e coisas divertidas para fazer durante todo National Harbor. Para a vida noturna, há um clube de noite no último andar do Gaylord Resort. Falar com o concierge sobre a obtenção na lista. É um clube privado, acessível apenas para os hóspedes do National Harbor. Há uma balsa que vai regularmente para Old Town Alexandria, onde muitos clientes gostam de sair para uma refeição agradável para comer e apreciar a arquitetura colonial da velha cidade. Clean, excellent value for this 2 bedroom condo at the Wyndham Resort development at National Harbor. Would definitely come back there! Thanks for your review for your review following your stay and we're very happy to hear that you enjoyed the accommodations and location! Let us know if we can help with any future bookings. The staff was friendly ad helpful, The apartment was comfortable and clean. Thank you for your review following your stay at the Wyndham National Harbor resort. We're happy to hear that your stay was comfortable and that you enjoyed your time at the resort! The longer stays are typically split into multiple pieces of inventory, so that may have been the initial confusion, but we have them merged into one so there aren't any room moves required. Please let us know if we can assist with any future accommodations. We were on a bit of a scouting mission for my son. He has aspirations of working in the DC area within a couple ears and he just wanted to visit the area to get a feel for it and to see how difficult it might be to find his way around. The process was as simple as it could be to book the property. A couple emails and we were set for the property. The location was absolutely perfect for our needs. We were a simple 10 minute ride in to the downtown DC area and other cities in the region. When we were done with our adventures, the location was a nice get away from the bustle of the city and yet we had everything we needed within a very short walking distance. I would definitely book this property on any future return trips, and I would highly recommend the property to anyone to enjoy! Thank you so much for leaving a review following your visit to National Harbor. It's wonderful to hear that you and your family enjoyed the resort and everything the area has to offer! Your explanation really does capture the feel for National Harbor. It's perfectly situated with a few easy options to get into the downtown D.C. area, but it is its own charming little town that has a lot of options for a relaxing day or evening away from the city life. Good luck with your son's future endeavors and please feel free to get in touch with us again for any accommodations you may need. We'd be happy to assist you. Convenient, upscale property in the heart of National Harbor. Park and walk. No need to drive to get to restaurants and bars. Will definitely stay again! 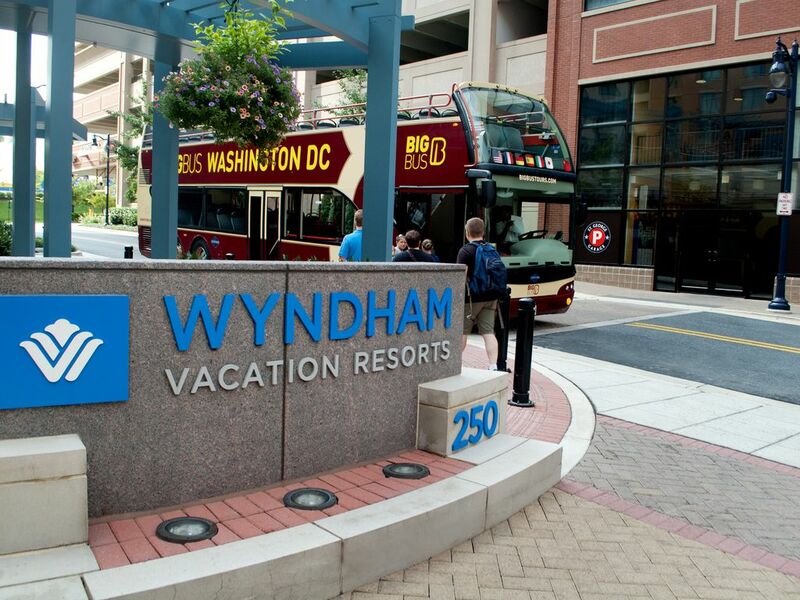 It's great to hear that you enjoyed everything about the Wyndham National Harbor resort! Thank you so much for leaving a review for future guests. The convenience and location are terrific benefits to this resort. Like you said, National Harbor is very pedestrian friendly and a charming town to walk through. If you need any accommodations in the future, we would be happy to assist you again! Great place to stay! Loved the location and the unit itself. This is a great property and I highly recommend it to anyone! It's great to hear that you enjoyed your stay and that you would recommend the Wyndham National Harbor to others! Thanks so much for taking the time to leave us a review. If you need any accommodations in the future, please don't hesitate to get in touch with us and we'd be happy to assist you once again. Very clean. Walking location for restaurants. Easy bus connection to DC. Great stay. Had my parents and brother with us so nice that we all had own room and bath yet all together in same unit. Thank you. Thank you for leaving us a review following your stay at the Wyndham National Harbor. It's terrific to hear that you enjoyed the resort with your family and that the location met all of your needs! If you need any future accommodations, please don't hesitate to get in touch with us again and we'd be happy to assist you. National Harbor em si tem muito a ver com festivais que vêm através, muitos restaurantes, uma discoteca no topo do Gaylord Hotel, uma seleção de bons restaurantes e entretenimento noturno ao longo do rio. Com D. C. apenas um táxi aquático passeio de distância, você vai ser capaz de explorar museus Smithsonian mundialmente famosos, o Capitólio, a Casa Branca, o Monumento Washington eo Memorial Lincoln. Para uma eventing elegante de música bem, participar do Kennedy Center para um desempenho surpreendente. Pegue na cultura de toda a multicultural em D. C., apreciar a história, a opulência, e as pessoas! Primary renter must be at least 21. The resort requires a security deposit of $100-$150 on a credit card upon check-in, which is released upon check-out. The name on the reservation must match the ID of the person checking in. It is the guest's responsibility to provide us with the name of the person who will be checking in, at the time of booking. There is a $99 fee if you need to change the name on the reservation. Even if another member of your party arrives first, they will not be able to check in before the person named on the reservation. If you do not provide us with the name you would like on the reservation, we will use the name and address that the reservation was booked under as the default. If another member of your party will be arriving before you, include their name in your message at the time of booking and will add their name instead of yours. Guests may not have more than one reservation booked in their name for the same dates. If you have booked another unit for the same dates with another company, you must make sure that the name on each reservation is different, or you will be in jeopardy of Wyndham canceling one of your reservations without notice. If you would like to book multiple units, please provide other names to put on the other reservations. A credit card that you provide at check-in is used as a security deposit. Rooms are inspected after Housekeeping cleans. Damage or missing items will be charged to your credit card on file. Wyndham has maximum occupancy set for each room type. If these rules are not followed by guests, Wyndham may cancel the reservation. Pets are not permitted. A service animal trained to perform special tasks is permitted. Resort Stay LLC is not responsible for severe weather or power outages. Guests can purchase travel insurance prior to their trip to protect themselves against unforeseen cancellation. Reservations are transferable for $99. Confirmation emails are provided by 14 days in advance.